3 - Download the aircraft folder to your desktop. Double click the zipped folder. NOTE!! Make sure if there is a "READ ME" file contained in the folder to read it. Some files need to be put into a certain folder so always read the read me file! 4 - You will then be asked where you want the files to be extracted. (If the "READ ME" file says otherwise then install as stated in the read me file. If there is no read me file or special instructions continue to step 5. 6 - When you are done, exit out of everything, open up fsx, and your newly installed aircraft should be in the list. 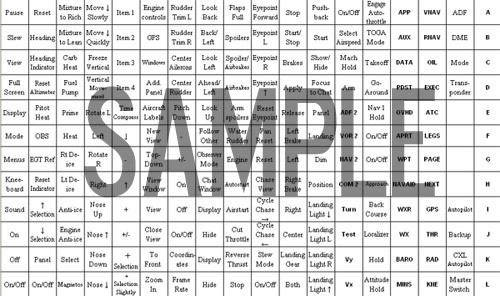 CLICK HERE TO DOWNLOAD THE "FLIGHT SIM KEY COMMAND GUIDE SHEET"
The United States Navy's Demonstration Team "The Blue Angels" Aircraft Painted is Ship Number One. FSX McDonnell Douglas F-15E Strike Eagle, of the 492nd Fighter Squadron (Mad Hatters), 48th Fighter Wing (Liberty Wing), USAFE, RAF, Lakenheath. Features bombs that drop, animated ailerons, all moving tail, rudder, flaps, engine intakes, airbrake, gear with compression, canopy and emergency tailhook. Panel and sound. FSX Northwest Airlines Douglas DC-9-50. This is the SGA Douglas DC9-50 in Northwest Airlines old colors for FSX. With this aircraft in FSX the jetways will come to the aircraft unlike some other add-ons, and this aircraft comes with a custom panel, all gauge files included, and the SGA sound set for the DC-9. FSX Piper Arrow III. This Piper PA-28R-201 Arrow III features moving parts, a virtual cockpit, accurate flight dynamics, a few new smooth gauges, one special AI aircraft, two models, three texture sets and a paint kit. FSX SAS McDonnell Douglas MD-81 package v1. A McDonnell Douglas MD-81 updated for FSX 3D panel, sounds and model included. Features Scandinavian Airlines in old and new livery. FSX Silverjet Boeing 767-200 registration G-SJET. Model by Project Open Sky. FSX NASA Space Shuttle. It also has slats and thrust reversers to help with control. It is extremely maneuverable, and can reach high altitudes as well as cruising at the highest speed FSX will allow. Built with FSDS, the shuttle has fully animated exteriors, including opening cargo bay doors. FSX General Dynamics YF-16. A repaint of Kirk Olsson's F-16 Viper for Flight Simulator X. This aircraft is painted in the scheme of the first prototype of the YF-16. The first of the two YF-16 prototypes, designed by a General Dynamics team under Harry Hillaker, was rolled out in patriotic red-white-and-blue colors on 13 December 1973, only 21 months after award of the contract. FS2004/FSX Air France Airbus A380-800. An accurate paint with realistic shadow, shine and reflective effects featuring 32 bit highly detailed graphics with night light effects. The model includes all the usual things such as a steering nosewheel, taxi and landing lights, dynamic shine and all moving parts, including a fully animated landing gear animation. FS2004/FSX Airbus A300B2, B2F, B4 and B4F 3D-model. Has compiled model, final textures plus all resource files. Also contains Gmax VC source files. It's up to you to make a nice flying aircraft out of it. Read GPL3.TXT or check out gplv3.fsf.org if you want to make mods of this files. In this package you can fly the one of the four Airbus A340-300 of the Olympic Airlines, the SX-DFA Olympia. To create this we use the famous A340-300 of Project Opensky. Also we include some marvelous sounds of the CFM56. So we decide to make a repaint for this aircraft. Features: panel, Virtual Cockpit, realistic Sounds and reworked flight dynamics. From Project Tupolev comes v9.5 of their Tupolev Tu-154B2 jet airliner. The complete package features a new visual model, 2D panel with ten sub-panels, virtual cockpit, sounds load editor. Liveries include Siberia Airlines, Krasair and Ural Airlines. Manual comes in Russian and English.